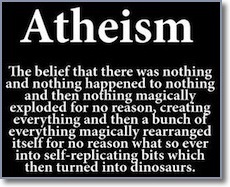 .Atheism means simply "without a belief in God". On occasion a theist might try to debate an atheist from the mistaken position that atheism means "no God" or "without God" when a more accurate understanding would be the definition above without belief in God. This is important because clarity of the position can then lead to discussions and an appropriate defense for the reasons for such a belief, just as a theist can give a rational argument for why he or she believes in a God. Atheism has been passed down over the last few centuries via teachings and writings mostly from the enlightenment period of the late 18th century. This belief struggled within itself: while its adherents would cling to the belief that there was no God in existence whatsover, they were at a complete loss to explain how humans came into being in the first place. They would struggle with the frustration of wanting to believe in something so bad while there was no evidence to support or even to speculate how we all got here. II. Hegel w/ Feurbach influenced Karl Marx, an avowed atheist, responsible for much of the humanism and atheism found in Eastern Europe and Asia today. III. Charles Darwin, the Theology major, writes, The Origin of The Species, a sort of "borrowed" manuscript from his grandfather's, Zoinomia. This is addressed further down in the reading. IV. Humanist Manifesto created in 1933 and signed by all prominent secular humanists of the day. ________1. The Universe is self-existing and not created. ________2. Man is a result of a continuous natural process. ________3. Mind is a projection of the body and nothing more. ________4. Man is molded mostly by his culture. ________5. There is no supernatural. ________6. Man has outgrown religion and any idea of God. ________11. All mankind deserves to share in the fruits from following the above tenets. ________12. Religious forms and ideas of our fathers are inadequate. ________13. The quest for the good life is still the central task for mankind. ________14. Man is alone responsible for the realization of his dreams. ________15. Intelligence and will bring the good life (fulfilled dreams) about. Atheists often times will say, "Where extraordinary claims are made, extraordinary evidence is required" which sounds quite logical at first but upon further thought, a theist could actually make an identical argument claiming the atheist's belief in the ‘non-existence of a god of any kind, any where, on any planet, and in any galaxy’ is itself an "extraordinary" claim that requires “extraordinary evidence”. 1. Moral Concepts argument against God – The Christian God being all-powerful and the God of love could not (some argue 'would' not - completely different argument) allow evil. a. If God was all-powerful, he could destroy evil. d. Theist Refutation: 1st premise is good, 2nd one fails to take into consideration the possibility that the good God may have some use for the evil to bring about a greater good. - Also fails to consider the aspect of time. God might use/allow evil for a time then ultimately destroy it. - The events we condemn and the moral law by which we condemn them are both traceable to the same source. a. FIRST - God is man’s wish: man is inadequate and requires someone/thing greater than himself to rescue him from his dilemmas. b. God arises from this desire and is therefore without objective reality. c. Refutation: Whether or not a man ‘wishes’ is no evidence for whether a thing exists or doesn’t exist! - Could we assume that since atheists wish for God to NOT exist, that He therefore does exist!? d. SECOND - God is a result of superstitious belief: Natural laws explain everything, we no longer need a God to explain things. e. refutation: genetic fallacy – assumes a point proven merely by virtue of tracing it to its source. - Could we assume that since a particular science arose out of magic or alchemy that it implies that science is invalid today? he may thwart his own omnipotence. Therefore, God does not exist. attribute of God. God’s power can do all the things that power CAN do. - How much power is required to make 2+2=6? 4 atom bombs? all loving yet all knowing; absolutely good yet absolutely free. These contradict each other logically. d. Refutation of ‘c’ – assumes that above attributes are mutually exclusive. A loving father disciplines his child in loving punishment. Agnosticism believes there is insufficient evidence to prove or disprove the existence or nonexistence of God. Criticizes theist for their dogmatism based on assumption. ________d. Therefore, talk of God is nonsense. ________________condemns this line of reasoning as nonsensical. ________b.but we cannot know a thing as it ‘truly’ is. ____________– “we cannot know the real” means that we cannot know this statement itself! ________in order to deny ANY knowledge of reality. ________b. Homo Erectus ‘Java Man’ – supposedly showed ‘expansion of th brain’. ____________chimps walk upright all the time. ____________those of the science community with a disposition toward humanism. ____________and was quickly reclassified to ‘homo sapien’. C. William Paley (18-19th cent.) – Argued from the position of Intelligent Design If one were to trip over a rock in a field, one could say it has lain there forever. If one were to trip over a watch, no one would say it has "lain there forever" because its parts are framed and assembled for ONE integral purpose: to tell time! We need not ‘see’ the construction process to recognize a designer. Like ancient works of art, we acknowledge a designer. We cannot infer that this watch is merely one in an infinite series of watches because we still have no account for the (original) design itself! In nature, even greater design exists (human eye) which is even greater evidence for a designer. – ‘cosmos’ universe; ‘logos’ rational thought/word; first Cause as sufficient reason of the cosmos. I. Premise 1 – every being which begins, has a cause for its beginning. - Anything that begins to exist, does so at a certain point in time. But since prior to things existence, all moments ar alike, there must be some cause that determines that the thing comes to exist at that moment. II. Premise 2 – The world is a being with a beginning - It is impossible that there should be an infinite regress of events in time, for if this were so we could never have arrived at today and that is absurd. I. Unmoved Mover – Anything that has the potential to move cannot actualize its own potential. Some other thing must cause it to move and something causes this other thing to move and so on its repeated. However, it cannot regress to infinity. It must have a first cause of motion. II. First Cause – Nothing can be self-caused because then it would have to bestow existence on itself. Therefore, there must be a first cause which is simply uncaused. This, everyone calls “God”. into and passing out of existence of the many possible being. _______orders, best provides for a rational unified view of reality. ____________independent of our recognition as the natural order of things is. ____________assume the reality of the moral order of objective value. ____________binding and obligatory for the finite world! ____________existent that is both personal and eternal, that is, God. ____________order often fails to realize the good that ought to be realized.